Van 21 t/m 26 juni heeft Anton voor z’n werk een reis naar Tokyo gemaakt. Hij heeft hiervan een verslag geschreven. Het is in het Engels geschreven, omdat we een aantal internationale vrienden hebben, maar vooral ook omdat hij in het weekend met een Japanse vriendin was opgetrokken en ze zo het verslag ook kan lezen. Sitting in the plane back to Europe. Leaving Tokyo, Japan behind. Will I ever be able to share the experience of the past days? Being honoured to visit our Tokyo headquarters, spend time with colleagues, have fabulous dinners at places where no tourists were found (except a rather tall Dutchman), and two amazing days with a friend who turned into the best friend one could ever wish for. No doubt, many things will get Lost in translation (LOL), since English is not my native tongue, but I will try anyway…. Not only to remember after the fresh memories have faded, but to share with those of you who don’t speak Dutch. The main part of this story will be about my two days off. Those two days may look like busy days while reading, but they weren’t at all. I owe that to my colleague and friend, who took two days of her precious time to guide me. 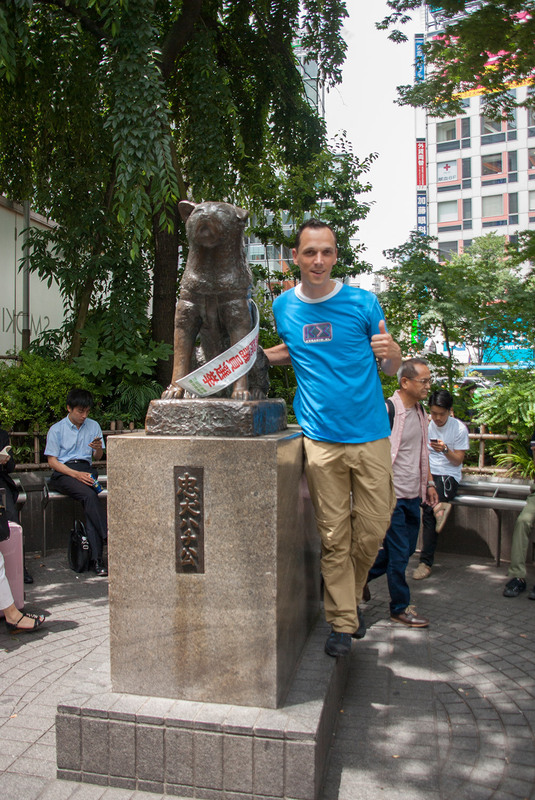 If you ever have the chance to visit Japan, don’t follow the tourists, but follow the locals. Probably, you will not be so lucky to have a friend guiding you, who is so patient to listen to your questions and stories, and being able to open heart and soul during the trip. I learned so many things, which put things in perspective. Talking about amae, omiai, ini, iki, ne and Prinses Mononoke… So fortunate to have a Dutch book by Kjeld Duits ( http://ikjeld.com/en/about ) in my suitcase… a must-read if you ever visit Japan or work with Japanese people. Therefore able to ask questions which my friend did not have immediate answers to… she also learned new things about her own country. 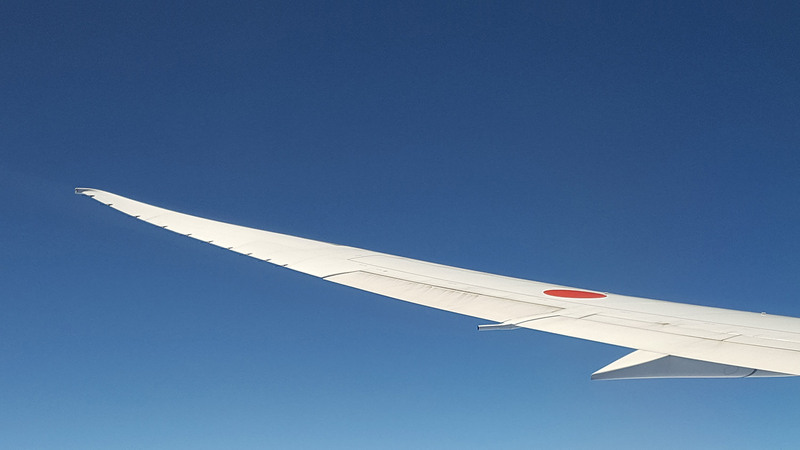 So here it goes, this is our visit to Tokyo and Kamakura. Starting near my hotel, at Tamachi train station, my friend travelled 1.5 hours to get there. No luggage boxes at the station, so we dropped her suitcase at my hotel. She told me later that day that she would stay at a capsule hostel close to Tamachi station. Check it out, these capsules are the smallest accommodations you’ll find anywhere, but reasonably priced in expensive Tokyo. Earlier that week, weather forecasts looked like rainy (not unusual in the rainy season of June), but it would turn into two very hot, humid but dry (you know what I mean) days, even with lots of sun on Sunday (what’s in a name?). First stop that Saturday was Tsukiji Fish Market. On its old location, it would be changed to another location later that year. Crowds were gathered around the train station and the first blocks with food stores. Wondering around, we managed to find the old fish market, hidden in the back. The real fish market is active from around 3:00 AM, when we arrived at 10:00 AM, the merchants were already wrapping up the day. We did not see the famous tune slicing, but nevertheless we saw so many different sorts of fish (dead and alive). Some of them we’ve never seen before. It was very nice to be at the market at this time, it was less crowded and we could walk around and stop whenever, wherever. This is a must-see when you are in Tokyo… amazing! 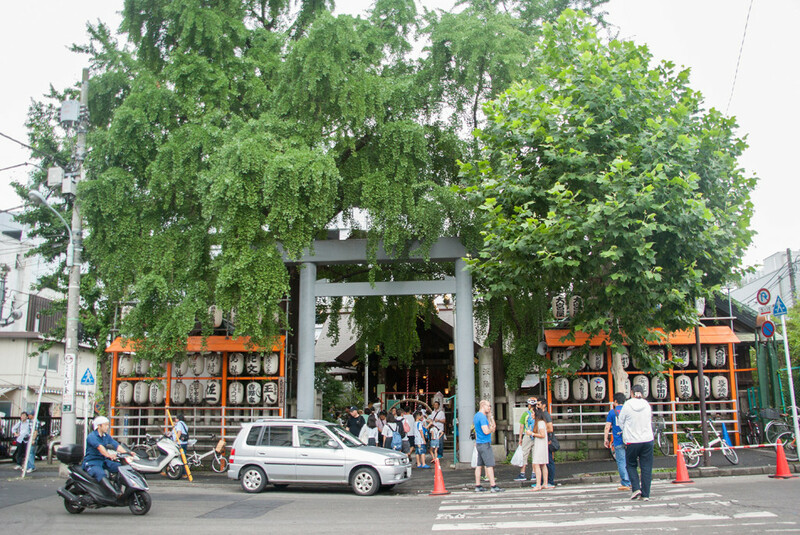 When returning to the restaurants part of Tsukiji, we visited our first Shinto Shrine. I learned about the difference between Shrines and Temples, and how to behave oneself in either one. We talked about Japan being a country in which there is room for many gods, and very fortunately hardly any religious fights. Young and old are waiting patiently in line for their prayer, it is a very common thing to see in Japan. Did my first prayer and bought my first stamp, being the proof of me visiting there. Unfortunately, there were no collector books to be sold, so I just collected the stamps. I was amazed to hear about the Japanese fortune notes, which you can buy. If it is good fortune, just keep it. If it is bad luck, just fold it around a fence or tree in the Shrine or Temple… so that it will stay there. We already decided to go for early sushi lunch nearby the market, but did not decide upon the restaurant. My friend had several places in mind, and was disappointed to see one of the best picks to be closed and other ones having very long queues. Or so, it looked like. But her Osaka business mind decided to double check the opening hours and just try the door of Shutoku 2-Goten. It turned out to be open and have two seats free on the second floor. Words cannot describe the taste and atmosphere. Me trying to get through the small space up to the stairs, minding both my head and the Japanese eating and finally fitting into the little chair. And then… best sushi ever. Permanent. Having somebody with you who can make any sense of the menu. 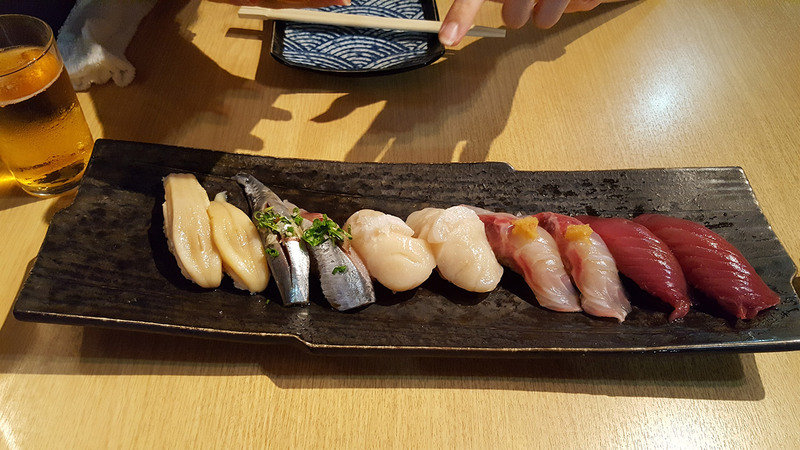 Have fish which may likely to be caught earlier that day, prepared in sight by hands which do that for years… katsuo, isaki, hotate, aji, mirugai, anago, squid, engawa, maguro and ikura… When we finished all our treats, the Japanese beer was refreshing and got us on our feet again. Our legs put in motion, accidentally we noticed Tsukiji Honganji Temple… an unusual shaped, almost Indian style Temple. We were drawn into this stretched building, like some other tourists only just noticing there was a funeral. The first row in the Temple was filled with people in black clothes, not bothered by several, mainly silent Japanese spectators. The singing of Buddhist priests completed the very impressive interior and atmosphere. Amazed about finding this Temple, but at the same time a bit awkward about intruding a funeral, we went outside. A train took us to Asakusa and Senso-ji Temple. Talking about crowds. Although we both don’t like being inside one, I think we enjoyed observing it. 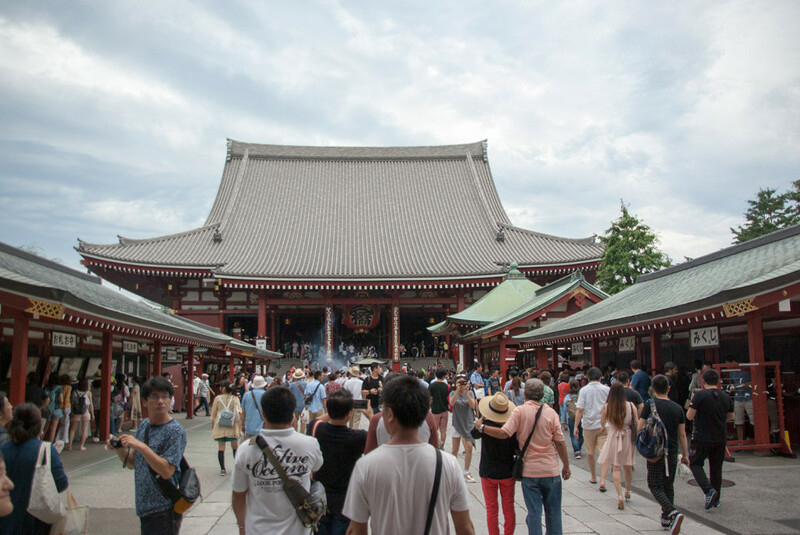 Asakusa might be a thing every tourist visits, but it should not be missed. The tower and some other parts were under construction, but that didn’t spoil the party. Wandered around, my second prayer (after washing our hands… always wash your hands before prayer in Japan) and bought my second stamp. Had some really good kakigori crushed ice with syrup, bought a real sensu in a street just behind the crowds. Saw many young non-Japanese in rental kimono, selfie sticks and a samurai ordering ice cream and taking a selfie! Walked some more to find Kannonura Street being a bit of a disappointment. But maybe it was merely a matter of high expectations of finding real Geisha walking there. Jimbocho would be the next destination via train. 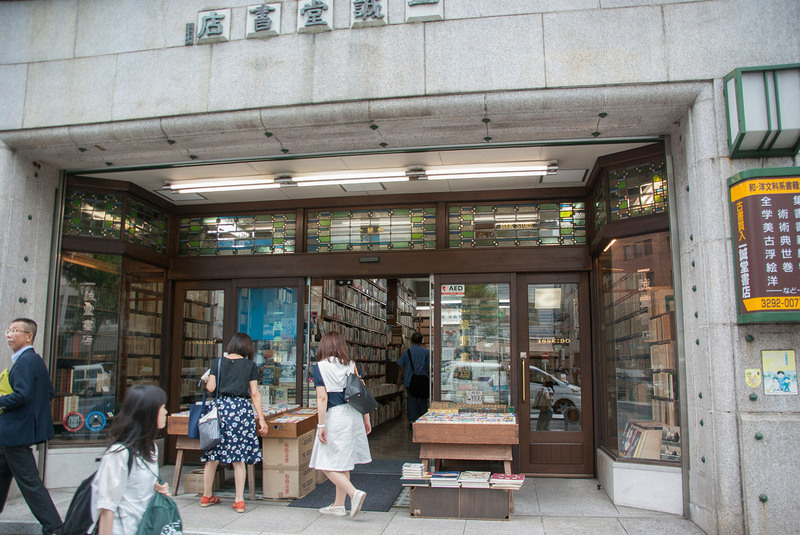 My girlfriend and me being collectors of second hand books, we decided not to go to the book store at Daikanyama, but to Jimbocho. My quest was to buy a book in Japanese for our collection. I suggested so many things, that we (that is, my friend) searched for children’s books, cultural and art books up to movie books and kimono books. I’ve never stared at book shelves without having a clue what the books are about. But my friend guided me from shelve to shelve… Ended up with two perfect books and her almost choking in a second hand store (which also collected dust during the process). Imperial Palace Gardens were next, but turned out to be closed. This time, her Osaka spirit (or did she get Dutch characteristics while staying here? ), trying to get in, did not work out. The guard politely, but strongly reminded us about closing time. Strange thing… within a couple of minutes, there was a loud alarm warning everybody that working hours were ending, also on this Saturday. Not for sure, but I have no doubt, some of the business people in the nearby office district were free to go home after six days of work. Just outside the gardens we figured out what to do, were to go for dinner. Both of us being movie lovers, she once suggested to have dinner at Gonpachi. This restaurant is the setting of the world-famous fighting scene in Kill Bill 1. Given the fact that we did not yet got hungry, thanks to sushi, icecream, the heat and continuous drinking of water, we decided to return to Tamachi station and find some dinner nearby. Still don’t know how she found it, but that doesn’t matter. She decided to have table bbq (actually Korean style, as I recall) at Biyando Shibaura with thin slices of the best Japanese meat one can find. 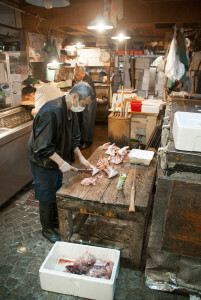 While accommodation can be very expensive in Tokyo, the food is relatively moderately priced, but of excellent quality. That might also be caused by my very selective and critical guide… who also selected a place to have sake to call it a day. Two doors along the same road, a restaurant with very traditional atmosphere (no shoes allowed) served many types of sake. That is, I’ve been told, since I could not tell based on the menu. She picked up her luggage at my hotel and she went to her hostel. Day two would go into the Eastern part of Tokyo and go outside Tokyo. 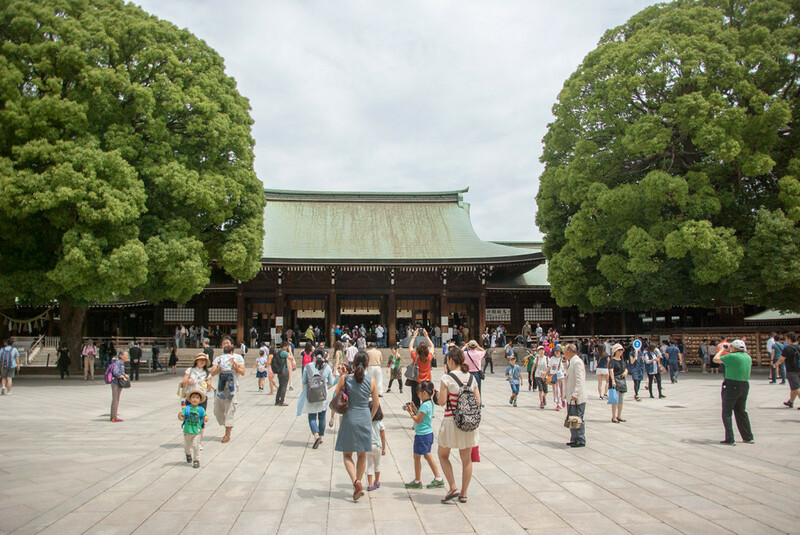 While you cannot visit all Temples and Shrines, you should definitely go to Meiji Shrine. The way to the Shrine is fabulous. 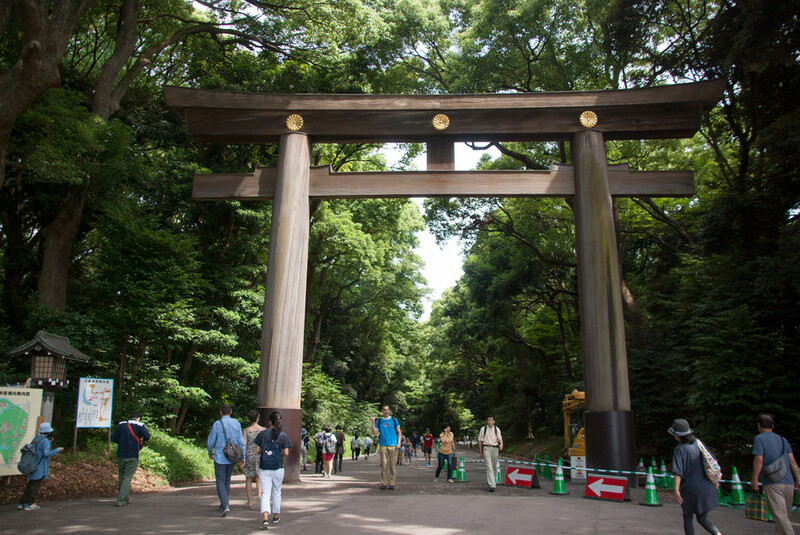 Passing several high Torii of wood, the road takes to into a park. As we learned later, this is not a natural forest, but planted by hand. Passing not only barrels of sake, but barrels of wine as well. After washing our hands at one of the most beautiful washing tombs, we noticed that we stumbled upon a traditional wedding. Strange to notice that people are accepting the tourist crowds being both witness and paparazzi, in order to get married in that fabulous place. The place is visited by many people, but keeps it’s dignity, also thanks to the very big main square. Over there, three old trees can be found. The solitary one is surrounded by handwritten wishes on wooden plates. In a side square, I bought myself my third stamp and a good luck charm. Then we returned to the station in the shadows of the trees. Some doubt about the timing of coffee, but we decided to head for Hachiko. 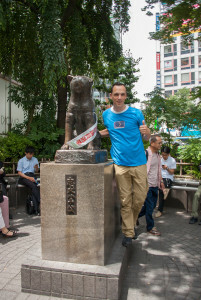 The statue of the famous Japanese dog… made world famous by an American movie with Richard Gere and the original Japanese version of the 80s. Just outside Shibuya station, lots of people are not only taking pictures along this statue, they also cross Shibuya Crossing, believed to be one of the most crowded and by far the most photographed crossings of Japan. Time for early lunch… when I should definitely have a taste of Ramen. Jummie! No doubt, I will look for Ramen in Dusseldorf, as my friend suggested. Oh, that was tasteful! That would help us through the day. Since the Great Buddha was on my wish list, we decided to leave Tokyo behind and take a train to Kamakura. During the one hour ride, the city of Tokyo showed het suburb faces and we had the chance to define our plans. At Kamakura station, we decided to get a train to Kamakura’s Hase and her Temple of flowers. On the platform, we (that is my friend) heard about the very long waiting time to see the flowers at Hasadera Temple. That did not stop the crowds of people getting into the trains. Since there are lots of hydrangeas in my home garden in The Netherlands, we decided to have a try to see them, but not get into long waiting lines. We would get a ticket (including a number for the waiting list) for the Hydrangeas Path and head for the Great Buddha first. This would buy us some time, maybe enough to have a chance to walk the Hydrangeas Path later that day. 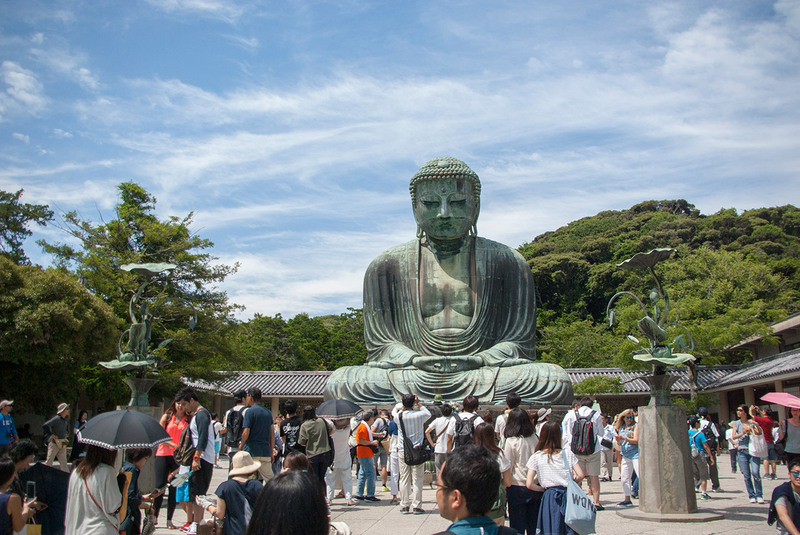 In the humid heat, we followed the crowds to the K?toku-in Great Buddha. But the crowds did not matter. Great Buddha mesmerized the both of us. It has been many years since my friend visited this place. For her it was a trip down memory lane and into the inside of the statue. Remarkable to have the opportunity to see its inner inside. With my height it was quite the challenge on the stairs, but other challenges were on its way…. but you’ll have to wait for those stories. We visited the back side garden, were silence was trapped from the crowds surrounding the main square, and watched old photos from the past and took some more photos in the present before we retraced our footsteps back to Hasadera Temple. 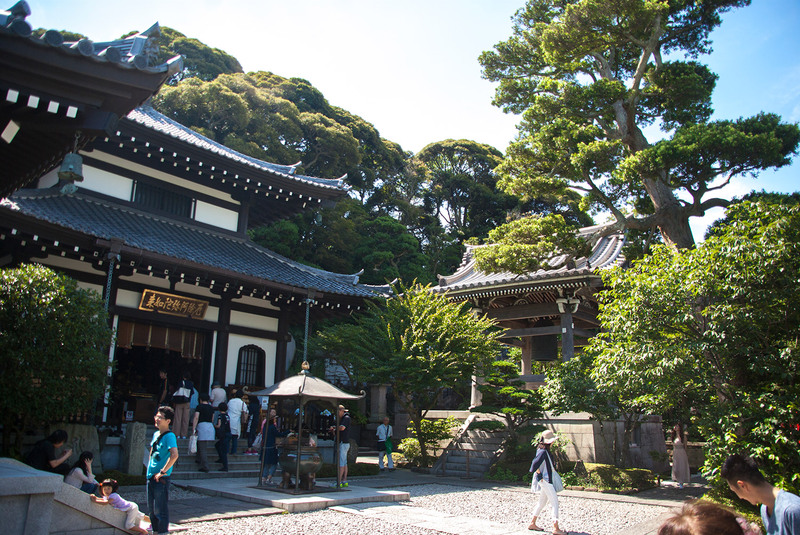 This Temple and its gardens, ponds and little statues are worth visiting even without the hydrangeas. 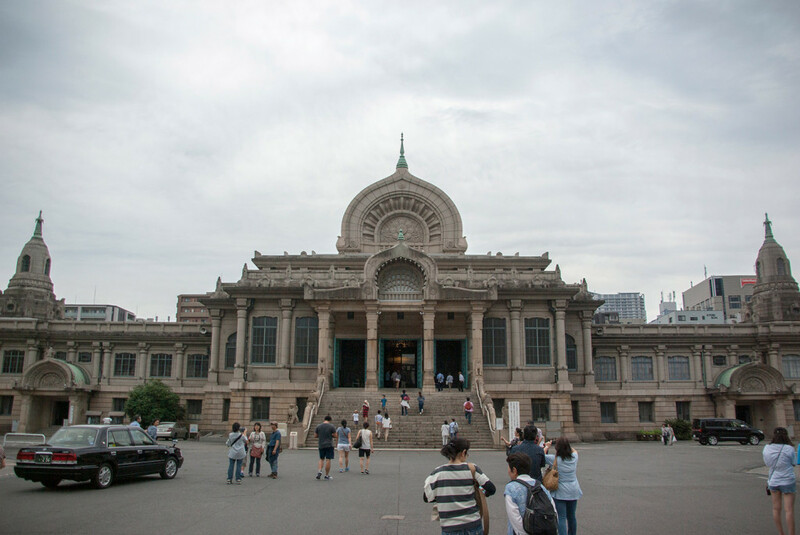 The eleven-headed statue of Kannon, goddess of mercy, the wooden library, and viewing point are some of the things to see over here. Just before leaving we discovered Benten-kutsu. In this cave several well-lit statues are found. Several rooms are connected with very low hall ways. These were even more tough challenges for this Dutchman, but worth it. When we finally rubbed a wooden statue for good fortune, we headed back to the train to Kamakura. The train from Kamakura was crowded, for sure. But the train back was breaking all my personal records. Crowds were waiting on the platform on a train with delay. When the train arrived, we all just collectively decided there was plenty of room for everyone. At a certain moment, I was happy to get in, next to the door. Placing my camera in the luggage tray above, I hoped the doors would be able to close, just before five or more elderly people decided there was still room. Encouraged by some shoulders, we all managed to squeeze in even more. I managed to get my mobile phone to make some video coverage, but was not able to put it back in my pants, being so close to polite, complete strangers which barely reached my shoulders. Two or three stops down the line, the train opened its doors, and took a deep breath after emptying its belly. Never felt any panic, all together a very funny experience never to forget. Our final destination would be via a crowded commercial street. My guide later confessed that this was not her intention, but it was fun all the same. Still not knowing what to expected, all of a sudden, there was the Shine waiting upstairs on a hill. The path to the Shrine was very impressive. Just before the stairs are the remains of a 1000-year-old ginkgo tree, which did not survive a storm in 2010. After several stair steps, we were not only rewarded by the Shrine, but by the view in the other direction as well. Looking down, we saw the kilometres long approach, with Torii, which we would take back to the station. But not before I got my fourth stamp and visiting a smaller Shrine surrounded by ponds (and biting turtles, a sign warned us, but we did not notice one). 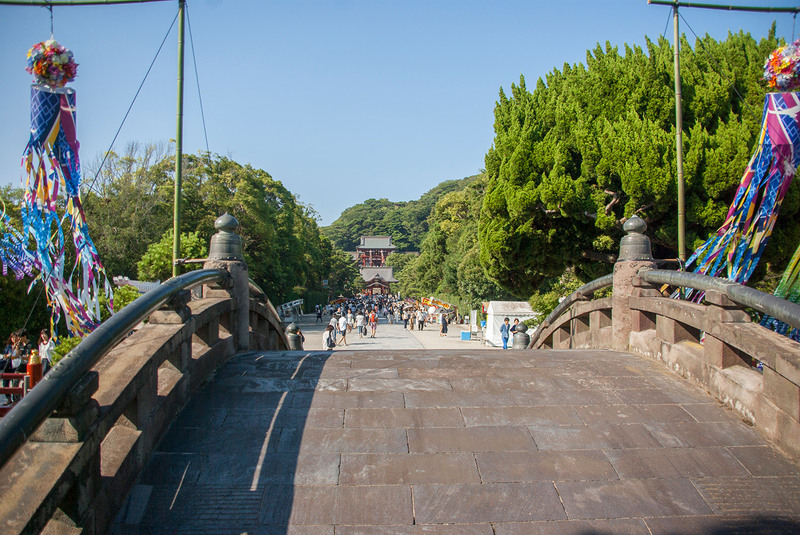 Walking back on the approach of the Shrine felt majestic, since the pathway is higher than the roads on both sides. My friend bought some favourite dove-shaped cookies before we decided to have some final chat, food and drinks before going separate ways back to home and hotel. This time beer in a stone mug with delicious Sashimi and other final Japanese treats. At Kamakura station, we bought ourselves refreshing ice-creams. I got clear directions were to change my train to arrive safely at Tamachi station, and we said goodbye. Hopefully not for long. Treasuring all the adventures of the past days, the feeling to leave a friend for a long time was stronger. Sitting in the plane, I suddenly realise that this experience was unique. 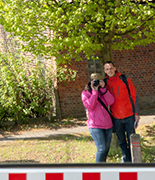 Have the opportunity to visit a country guided by a local is not very common, but visiting with a local friend is one in a kind. I am forever in your debt… Arigato! Wauw, what a story! Very impressive and a memory you’ll never forget.